What Northern Ireland lacks in size, it more than makes up for it with things to do and see. The region is full of attractions, unusual destinations, film locations, history, food and drink, and stunning landscapes. We took to the roads to find the best things to do in Northern Ireland. This was nothing like our previous adventures/misadventures we had while Overlanding Africa. Instead, it was charming and relaxing. Northern Ireland may have some inclement weather, but that’s nothing that the right packable down jacket can’t fix and winter gear can’t fix. We had a fabulous road trip and discovered so many things to do in Northern Ireland. Here are a few ideas for your future planning! This coastal causeway route is one of the most beautiful road trips in the world. Some of the best things to do in Northern Ireland is along this lovely route and it’s well worth at least a day or two to explore. We were able to hit most of the main sights in one day. However, we recommend two to three days to hit most the sights and leave some time to enjoy and get out of the car. The scenery along the route is some of the best in the world. The route is packed with Game of Thrones locations, so any fan (like me) will enjoy seeing where the magic was brought to life. You can even book a Game of Thrones tour! If you’re not up for driving the route yourself you can book a tour to all of the sights on the Coastal Causeway route. Book A Coastal Causeway Tour Here! If you know any of the natural landmarks of Northern Ireland it has to be Giant’s Causeway. 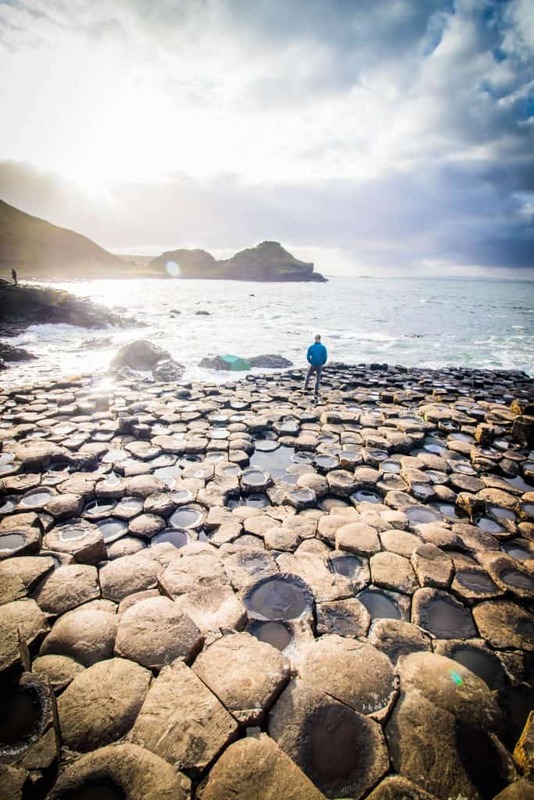 Almost 60 million years ago the Giants Causeway was formed from and this series of basalt rock columns is Northern Ireland’s only UNESCO world heritage site. This is the one destination that you can not miss on a trip to Northern Ireland. It’s world famous destination and after visiting we could see why. Rarely do we find such naturally beautiful spots on this planet. We had two days of sunshine in Ireland and we were lucky to spend one of them at the Giant’s Causeway. If you are driving yourself just note that it is £8.50 to park and have access to the cafe. However, we were able to avoid this charge by parking down the street and walking about 10 minutes to the main tourist entrance. 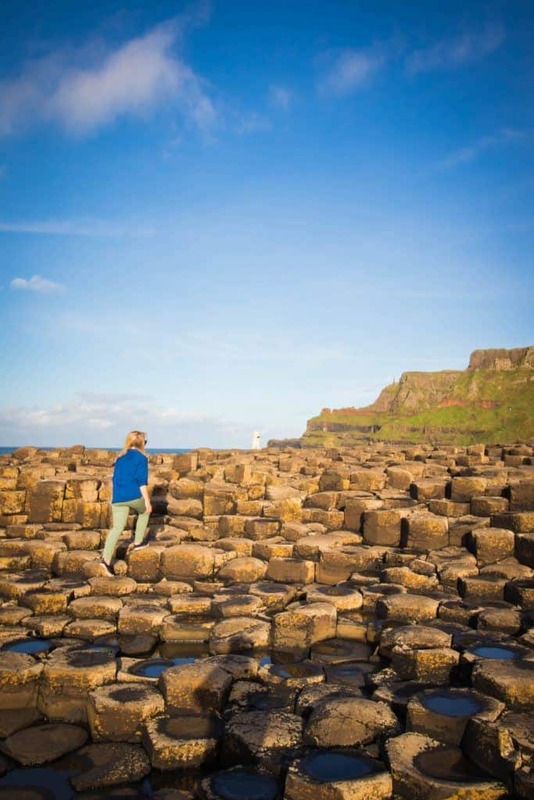 Book A Giant’s Causeway Tour Here! This is was the most beautiful castle we saw in Ireland. It’s not much of a surprise as it’s one of the most visited sites in Northern Ireland. It’s only ruins now, but its setting and sheer scale are still impressive, to say the least. As it is one of the most photogenic spots along the coast make sure to arrive with early for good light and bring your favorite travel camera. 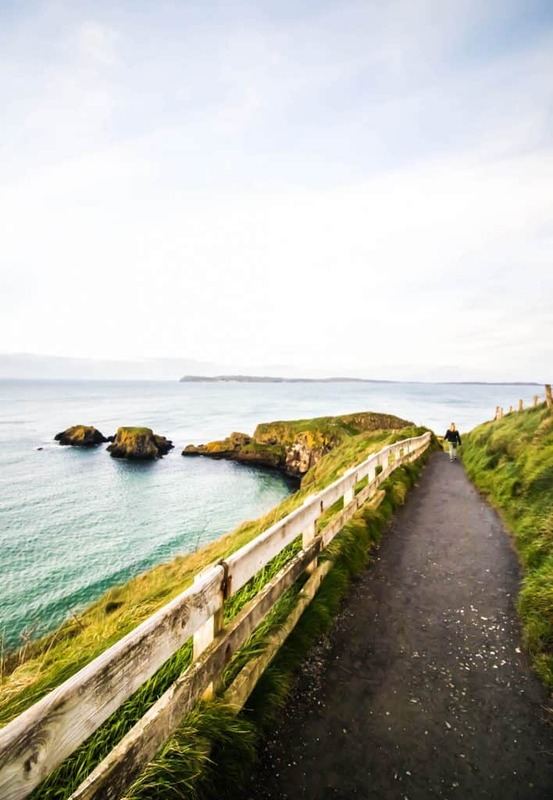 The Causeway Coast is an absolutely stunning place for a walk. 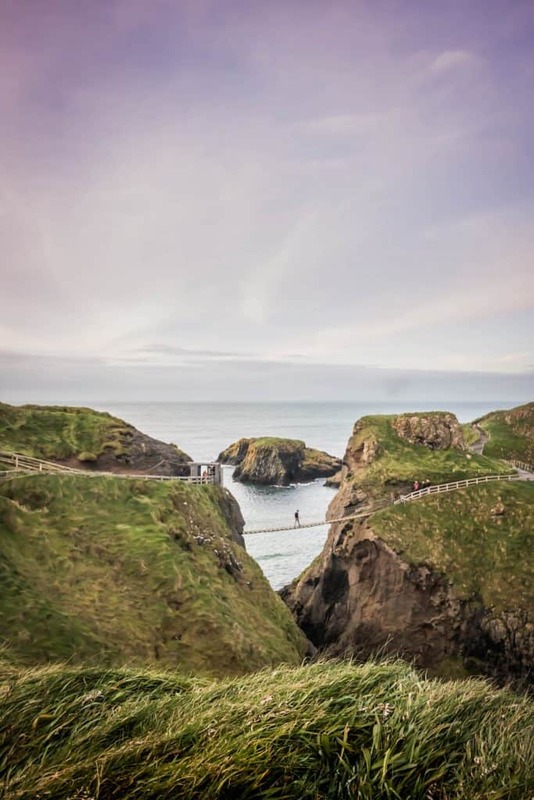 Nearby to Giant’s Causeway, you can actually take a walk along the coast to check out a famous rope bridge perched between the coast and a small island. It’s a small bridge, but given its height and precarious location it well worth checking out. We were a bit disappointed that it now costs money to walk across the bridge. So, we didn’t feel like dropping £7 to walk across a 15-meter long bridge. Instead, we enjoyed the beautiful coastline and snapped photographs of people crossing the bridge from the mainland. As a side note, the overflow carpark here is known as the Larrybane Quarry. The former quarry was another setting from the Game of Thrones. The scene takes places in the third episode of Season 2 as Catelyn Stark meets with Renly Baratheon. So, if you’re a fan of the show it’s well worth seeing! 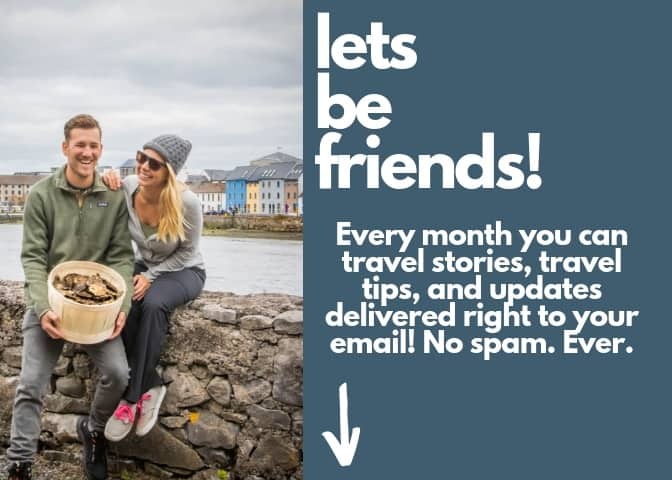 This is one of the best things to do in Ireland! A real highlight. This is amazingly beautiful little port town that used to be a port for shipping goods out of Northern Ireland. The historic harbor has made appearances in Game of Thrones and it’s certainly photogenic. If you’re a fan of the fantasy series it’s location was used as Pyke Bay on the Iron Islands. The picturesque bay is the perfect place to park and have a midday picnic. Surprise! Another Game of Thrones location that also happens to be one of the most photographed in Northern Ireland. The location is famous for a long row of beech trees that overhang a stretch of road. It produces the effect of a tunnel and was purposely built to impress visitors to the Georgian mansion the Gracehill House. The tree-lined road has been standing for 2 centuries and has only grown with age. We arrived a bit too late in the day to snap many photos because we had spent too long admiring the beauty of Giant’s Causeway. Another reason why this trip is best done in two days! Parking: Free parking at the Hedges Hotel. 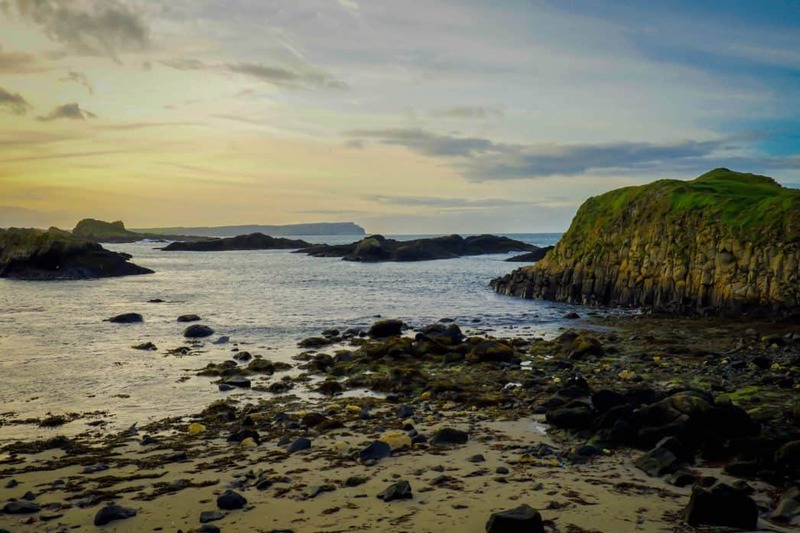 Just a short ferry ride off the coast lies Rathlin Island. The island is well known for a resident bird population. In the right season, you can find puffins, guillemots, and razorbills. The island also plays an important part in Scottish and Irish history as the famous Robert the Bruce retreated to the island in exile after being defeated by the English. However, in his darkest hour on the dramatic island, he found inspiration through a spider and decided that he’d continue to fight for Scottish independence. The story has lived on in Scottish and Irish history and spiders have long been treasured because they inspired a king! It’s a charming island that you can reach via ferry. A number of pubs, guesthouses, and friendly locals will be waiting for visitors who do decide to make the worthwhile trip. In the town of Bushmills, you can find the birthplace Ireland’s most well-known whiskey producer. The distillery is still in operation offering visitors a chance for a tour and to sample some of their whiskeys. The whiskey actually dates back to 1784! I’m a big fan of whiskey and always jump at the chance to learn some more about the spirit. I was surprised to find some fine vintages (10 and 21 years) I was unaware of and found them to be excellent! Irish Whiskey differs from Scotch as it tripled distilled instead of double and the result is a lighter whiskey. They also forgo the use of peat to add a level of smokiness like many Scotch whiskys. Some could say the result is a more drinkable spirit, but that remains to be debated. Nearly a century ago some very bold Irishmen build a stunning cliff walk that defies the sea. Only to 20 miles North of Belfast, the walk makes for a great first or last stop on your way up the Coastal Causeway Route. It’s a series of bridges, tunnels, and paths that wind through basalt caves and cliff faces. The walk was closed for nearly five decades until it was renovated and opened to visitors in 2014. It has quickly become a hit and must-see on the route. The new experience features a museum, tours, and cafe. Hours: Open Daily: 9:30 – 4:30 – Closed in winter! It’s not your standard tourist city, but those always seem to be our favorites. Not long ago the city was known for violence, The Troubles, that rocked it as Protestants and Catholics clashed. However, since then the city has made a triumphant return and continues to pull in more tourists every year, Tasha has been back twice now because she loves it so much! Head to the city for pubs, museums, Victorian restored buildings, intriguing history, and culinary bites. Any visitor who cares to learn about a time not long ago known as the “Troubles” should be sure to take what is known as a Black Cab tour. These informal tours take place in the back of a black taxi cab. Your local cabbie takes you back through time and you explore the site of numerous conflicts throughout Belfast’s history. They’re meant to be light-hearted, intriguing, and reflective. When Natasha first came here she was on the fence about joining a tour, but after joining a group and doing it she found out there was no better way to learn about the countries history than to be given a tour by someone who lived through it! It’s a must in Belfast! You can book your cab here! Tasha loved this one so much she’s now been twice! The World Travel Awards have even given it the Best Tourist Attraction Award in 2016. Belfast was the birthplace of the doomed Titanic and shipbuilding, in general, has long been associated with Belfast. The building design is truly unique. Some refer to it as a metal iceberg while the architect drew inspiration from ship hulls being built in the Harland & Wolff shipyards right next door. 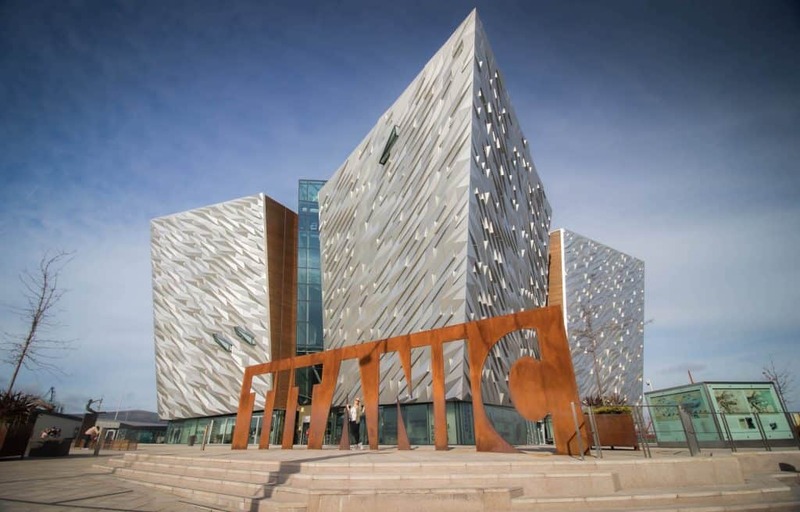 The museum stretches back through time celebrating Belfast’s industrial heritage to the discovery of Titanic’s final resting place in the modern era. It’s largely interactive meaning that both adults and children can have a lot of enjoyment moving through the exhibits. Admission: Adults £18.00, children £8.00, family £44.00 * Be warned in the summer season they do sell a limited number of tickets so it is best to book in advance. Some could say this is for the young of heart but in Ireland everyone drinks. We regularly found ourselves amongst all manner of people in Ireland’s traditional pubs. Young or old, rich or poor, everyone finds a home in one Ireland’s pubs. They’re focal points for Irish culture and the best way to experience Celtic music. A pub crawl involves a tour across a collection of different pubs. Some of these tours target backpackers looking for a party while others focus on history or live music. The food scene in Belfast is quickly changing. On our stay in the city, we found a number of tantalizing restaurants to choose from and ended up trying Causerie Bistro in the Europa Hotel and Yügo a new Asian fusion restaurant. Causerie Bistro was the easy choice as it was located on the first floor of our hotel. It serves up many Irish staples such as bangers and mash, curries, fish and chips, and steaks. All of it locally! To top it off I tried their “chocolate brownie” what I got was a massive sundae that was intoxicating, and so delicious I left reeling from a sugar high. I couldn’t say no! Yügo serves up some amazing food and one of the best meals we’ve had in the Europe thus far. It’s menu consists of various small plates of menu items inspired by Japanese and Korean cooking. Of course, there are many places to eat in the capital city. I recommend checking out reviews on Trip Advisor or asking a local to see what you like best. 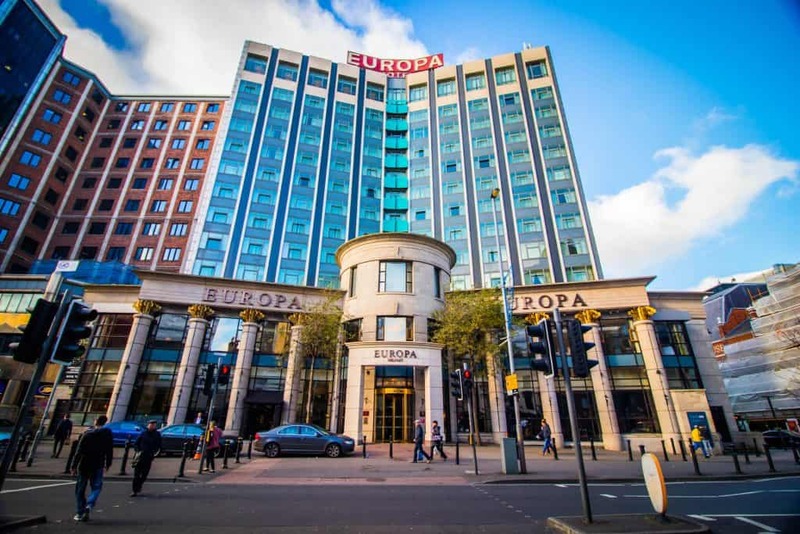 Belfast has an ever-growing selection of hotels in the city and we stayed at the Europa Hotel. It is more or less the most well-known hotel in Belfast. 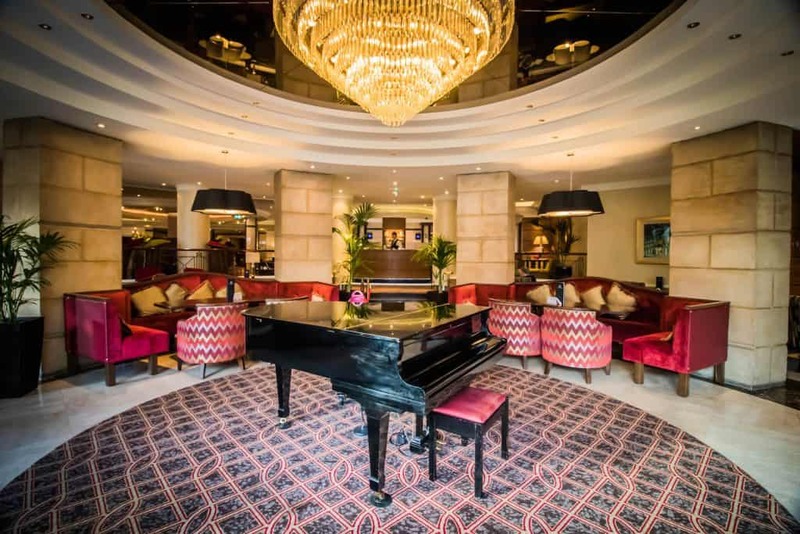 While the large marble lobby and beautiful first floor piano bar seem like a far cry from the hotel’s former claim to fame it is actually known in history as the most bombed building in Europe. That’s right the hotel was bombed 36 times throughout the period known as the Troubles. Now it is a beautiful hotel and an iconic part of Belfast. It has undergone a beautiful refurbishment making the hotel stylish and grand. We had the pleasure of staying in one of their suites which were larger than many of the full apartments we stayed on our trip through Northern Ireland. We overlooked the business of Belfast from one of the top floors and enjoyed watching the sunset each day we were in Belfast from here. My favorite place in the hotel has to the piano bar that looks down on the street above and out to the Crown pub a famous institution of Belfast much like the hotel itself. Honestly, I can’t really imagine staying in a more fitting hotel when visiting Belfast. Also known as Derry this is the second city in Northern Ireland. It was once an important inland port that used the River Foyle, but after the division of Ireland, it lost natural hinterland. It has a long history with amazing 17th-century walls around the old town that still remain largely intact. We took an afternoon off from the sightseeing and just ambled around the city checking coffee shops and restaurants. This is dense forest feels like taking a step into a fairytale. Its playful garden designs date back to the 18th century and since then it has only grown with age. You can find grottos, “castles,” caves, bridges, and rocky outcrops in an old wood forest. Many of the trees here were planted as part of an experiment, as you can find monkey puzzle, eucalyptus, redwoods, and Monterey pines. The forest feels magical and it shouldn’t be any surprise it has made a few film appearances including (what else?) Game of Thrones. Pick up a car to get around! 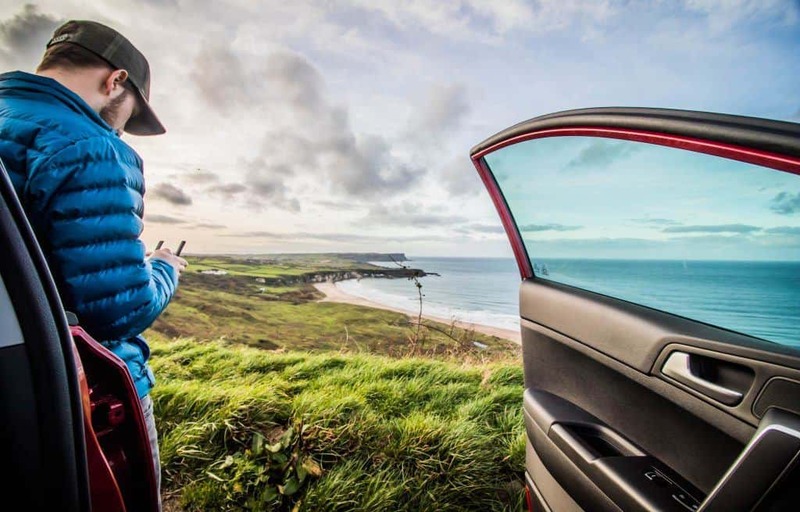 There is no better way to explore Ireland than with your own car. Of course, you can rely on public transport, but if you are a group of two or more a car may be the more economical (and definitely easier) way to go. We used Hertz rental car for the length of our stay in Ireland and for the third time (and now last) of using Hertz we were overcharged at the end of our rental. No notice of being charged and we have signed copies of the receipt that was the final bill. But unfortunately, they continue to randomly charge our credit card and we are forever in ongoing fights with them. Save yourself the trouble and use a different car company. We’ve always had great experiences with SiXT and will be using them from now on.